Dani and Keely imagined that life was more magical than others believed. If they had to be summed up, their one plus one would equal three. Together, they became something greater. It was twin sisters against the world. But the world had different plans. The man followed them to their secret tree house that unusually warm day in September. He only came for one, there and gone in the blink of an eye. 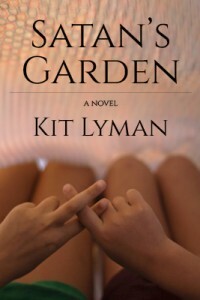 “Satan’s Garden” takes you on the six-year journey of two sisters who learn what it means to survive. It’s a story of resiliency, hope, and above all, a bond that cannot be taken away. It teaches us how quickly life can change and yet how much of it we can change ourselves. Although I originally pursued comedy as a screenwriter, I have always been drawn to the thriller genre and its evolution over the years. Psycho-thrillers are challenging to write and exciting to imagine, and their authors have been pushing the boundaries more and more. Desensitization is a concern for writers because it creates this plaguing pressure to be more shocking than the next, to be darker and more twisted. I was inspired to take a step back and not give in to that pressure. “Satan’s Garden” does capture the horrors and devastation that we may come across in life, but those parts aren’t what I hope to leave behind.